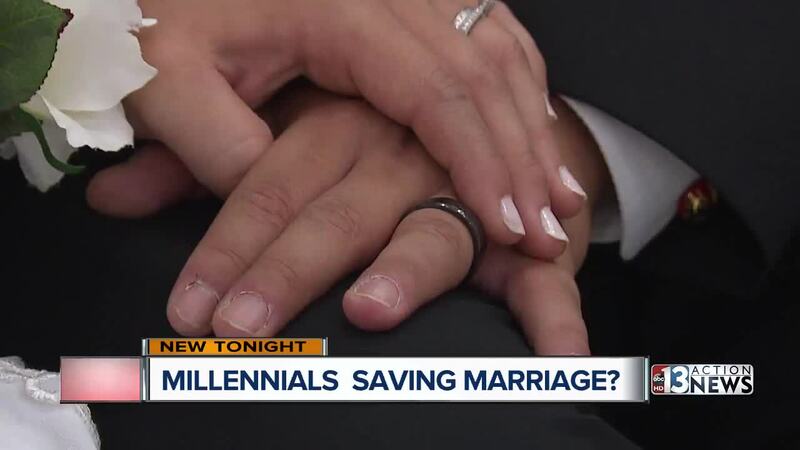 LAS VEGAS — It seems millennials are always being blamed for a lot of bad trends, but now it seems they along with Generation X are getting credit for something good — lowering the divorce rate. According to the United States Census Bureau people under 45 are helping drive down the divorce rate. Cristina and Geovanni Hernandez walked down the aisle for a second time Wednesday night at the Little White Wedding Chapel on Las Vegas Boulevard. It was their 10-year anniversary. "There's the pressure of wanting to do social things and be out there still and travel," Hernandez said. He believes millennials are deeply invested in commitment. "I personally wanted a family and to settle down," Hernandez said. According to census information Baby Boomers who married young like Geovanni and Cristina were more likely to have divorced and remarried. Cristina believes that example made Gen X and Millennials pickier. "I think they are having success when they wait because they don't go through those struggles," said Cristina. She believes they are more conscious of the previous generations relationship failures. "Personally for me taking advice from my elders," said Cristina "You stick with it." In Las Vegas, a drive-through wedding ceremony is actually a thing, but experts aren't surprised that the road to matrimony for millennials is longer and filled with more twists and turns. "I just think they are savvier," said Nancy Gabriel who sees the trend as a divorce mediator. "I think it's financial," Gabriel said. "They are going to school establishing their financial histories, perhaps buying a house. They are certainly having kids and they are coming into my office. Not for divorces. More for parenting plans."